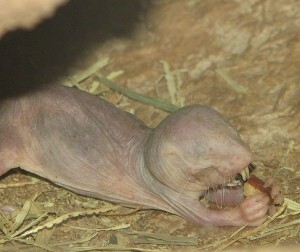 Naked Mole Rat in a Zoo.© Roman Klementschitz, Wien. GNU Free Documentation License. Scientists can learn a lot from naked mole rats, as these little rodents don’t show any symptoms of old age despite their long life expectancy. During several decades of research on naked mole rats no case of cancer development was reported. Scientists now found out what might confer cancer resistance to these rodents. Naked mole rats (Heterocephalus glaber) also known as the sand puppy or desert mole rat, live in huge subterranean burrows in the dry and hot semideserts of eastern Africa. They live in eusocial societies similar to those of social insects comprising 20 to 300 individuals. Every member of this eusociety has different duties according to its age. They are only the size of a mouse, but live 30 years and more, being the longest-living rodents we know. During their long life they develop nearly any symptoms of old age. 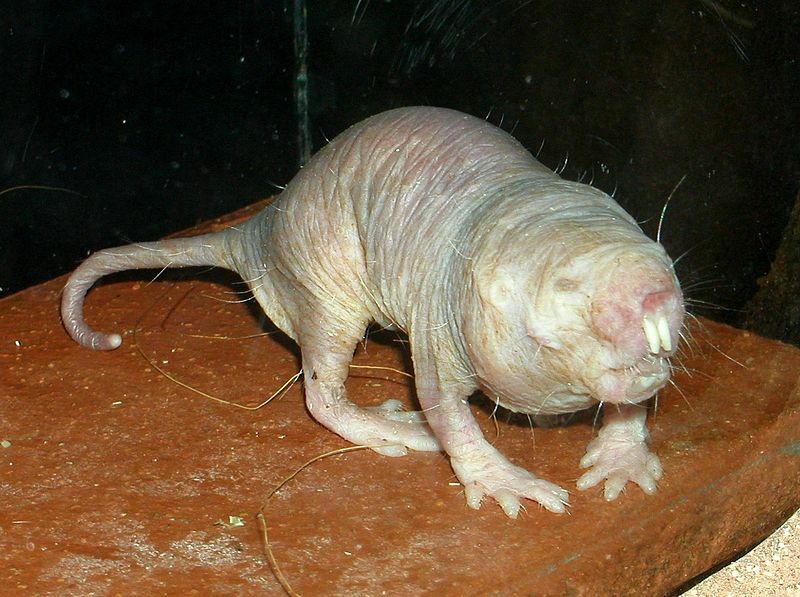 Mortality rates of naked mole rats don’t rise with age and they are still fertile in very old age. They never develop cancer cells and even in cell cultures scientists did not succeed in transforming naked mole rat cells into cancer cells, what is easily acomplished with human and mouse cells. The research couple Vera Gorbunova and Andrei Seluanov from the University of Rochester found out how naked mole rats suppress cancer development. For this purpose they produce a complex sugar molecule that prevents their cells from clumping together and forming tumors. Whether this sugar molecule is applicable to human cancer therapy still awaits investigation. In the body this sugar molecule resides in the colloidal material that surrounds the cells – the extracellular matrix. Cancer scientists are long convinced that the extracellular matrix plays a central role in cancer development. Why the naked mole rat is so interesting to cancer scientists. Most scientists study cancer development in the very short-lived mouse, that only lives for maximally four years. Cancer scientists prefer mice for their studies because these rodents are exceptionally prone to cancer. This is why researchers can learn form them which factors foster cancer development. Vera Gorbunova and Andrei Seluanov pursued the opposite strategy. They where systematically searching for a rodent, which is extremely long-lived. Their hope was to learn form this animal how to avoid cancer development ab initio. Because a long-lived animal needs to be capable to efficiently fight cancer in order not to become a victim of the malignant growth of its own tumor cells. Beavers and gray squirrels can live for more than 20 years. But naked more rats outshine both by their life expectancy of over 30 years. What is more naked mole rats are a well studied species. Due to their exceptional social behaviour scinetists are studying these animals for many years. Similar to ants all animals of one burrow are descendents of the same female – the queen. The workers don’t propagate. Only the strongest males are winning the favor of the queen. 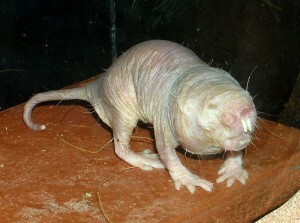 During this long lasting research no case of cancer in naked mole rats has been reported so far. This was exactly the right species Vera Gorbunovas and Andrei Seluanov had been looking for. © Trisha M Shears. Public domain. What distinguishes naked mole rat cells form human and mouse cells? At the beginning of their investigations the scientists did not exactly know where to start their search for the naked mole rats cancer resistance. So they started with cultivating cells of these rodents in cell culture. For this purpose they chose the well-tried fibroblasts – connective tissue cells involved in the production of the extracellular matrix. Human or mouse fibroblasts grown in culture dishes divide until they have covered the surface of the culture dish completely. As soon as they get into touch with neighboring cells their further growth is hindered. This phenomenon is called contact inhibition – a natural protection against uncontrolled cell growth, which occurs in cancer. A typical cancer cells is insensitive to contact inhibition. It continues dividing even when in contact with neighboring cells. When the scientists grew the naked mole rat fibroblasts in a culture dish they experienced a surprise. These cells already stopped dividing at one third of the cell density, that the researchers where used from human cells. This was the first hint that naked mole rats are better protected against uncontrolled cell growth than mice and humans. Responsible for the stop of cell replication is the receptor p16 located on the surface of the cells, that gets activated as soon as cells should cease to grow. From where do the cells get the signal not to divide any further? Like for any lock a key exists the receptor was expected to be activated by a ligand – a molecule that binds to the receptor. Only after the binding of the ligand to the receptor the signal to stop proliferation will be transformed into the cell. So the scientists started searching for the molecule that was responsible for the activation of p16. Like often in research chance came to aid the scientists. The technicians working with the naked mole rat cells complained, that the handling of the cells became more and more complicated over time. The greasiness of the culture medium increased, the denser the cells had grown. The scientists wondered what this grease might be and decided to investigate it. Christopher Hine, a member of the research group, found out, that the sirup consists of the sugar molecule hyaluronan, a major component of the extracellular matrix. To investigate the role this sugar molecule plays for cell growth the researchers removed hyaluronan from the cell cultures. To this end they added the hyaluronan degrading enzyme hyaluronidase to the cells. As soon, as the cell cultures where free of hyaluronan the cells started growing checkless devoid of contact inhibition. A prerequisite of cancer development. Once the scientists removed the enzyme from the cell cultures – so the cells where again able to produce hyaluronan – the cells stopped their unchecked division. This was the proof, that hyaluronan is the receptor that binds p16 on the cells surface. In this way the cells receive the signal to stop their growth. Hyaluronan is common in animals. It lubricates the jointsand is an essential component of skin and cartilage. It is used widely as therapeutic agent: it is a component in skin creams, is used for arthritis therapy and gets applied for cosmetic surgery. But what is so unique with the naked mole rats hyaluronan, that it is able to protect these animals from developing cancer? Hyaluronan consists of a long chain of sugar molecules. The length of this chain is different in every species. When the scientists isolated and examined hyaluronan of the naked mole rats, they discovered, that it was extraordinarily big: five times as long as the hyaluronan humans and mice possess. Could it be the size of hyaluronan, that confers cancer resistance to naked mole rats? Other scientists found out, that longer hyaluronan chains can prevent cell division and inflammatory processes. They signalize the body, that the tissue is mature and intact. Smaller hyaluronan chains on the other hand can convey the opposite signal. Particularly in tissue damaged after injuries the short hyaluronan molecules signalize the cells to divide and start wound healing. Similar mechanisms also play a role in cancer development. But the size of the hyaluronan is not the only difference to humans. Naked mole rats also produce an huge amount of this molecule. The reason is, that the enzyme, that produces hyaluronan is much more active in naked mole rats than in humans. At the same time the enzyme, that degrades hyaluronan is working only very slowly. This shifted equilibrium of production and degradation of hyaluronan allows the naked mole rats to build up these extraordinarily big amounts of hyaluronan, that they then can integrate into their extracellular matrix. This still does not prove, that big hyaluronan molecules can severe as cancer protection. To evaluate this, the scientists did the following experiment: In the naked mole rat cells they turned off a so called tumor suppressor gene, named p53. A tumor suppressor gene is a gene, that prevents cancer development. At the same time they activated a so called oncogene, called Ras. An oncogene is a gene which fosters tumor formation. In other words, at the same time they shut down a cancer protection gene and activated a gen that promotes tumor development. Such a manipulation would be sufficient to transform human and mouse cells into cancer cells. Not so the naked mole rat cells, as long as they where still able to produce long-chained hyaluronan. Only when the scientists prevented the naked mole rat cells from producing hyaluronan, by activating the enzyme, that degrades hyaluronan, the naked mole rat cells formed tumors. This was the proof, that hyaluronan really protects the naked mole rat cells from growing tumor-like. For what purpose does the naked mole rat produce hyaluronan? But why does the naked mole rat produce such huge hyaluronan molecules? The scientist can also answer this question: They assume, that the giant molecules are responsible for the flexibility and elasticity of the naked mole rats skin. So the solely subterranian living animals can easily squeeze through the narrow tunnels in their burrows. Cancer protection only eventually developed as useful side effect. The scientists where confident, that these findings can also be used for human cancer therapy. But like with all early state science caution is advisable. The role of hyaluronan in human cancer development is by far not fully understood. There are even cases of tumor cells reported, that used the production of hyaluronan to protect themselves from chemotherapy. In addition the research results from Rochester might only represent one mechanism by which naked mole rats prevent cancer development. The animals also have a different set of enzymes for elongation of telomeres, the repetitive elements at the ends of chromosomes and a reduced metabolic activity. Both of these phemomena could also be the reason for the cancer protection of naked mole rats. A plethora of experiments showed a clear relation between a reduced metabolic activity, accomplished by a calorie-reduced diet, and a considerable prolongation of life, which was accompanied by a reduced cancer rate. Nevertheless the work of the team of Vera Gorbunova and Andrei Seluanov still is a promising approach. Expectations are high as to what results future experiments will bring. Link to a video on, why naked mole rats live so long, from Dr Chris Faulkes from Queen Mary University London. A Video from animalevidence. Link to a video from Cornell University (USA) about the social behaviour of naked mole rats in Afrika. Naked mole rats live in Kenya, Ethiopia and Somalia. They live in huge subterranian burrows and feed on big tubers which they find by digging. One colony can comprise more than hundred individuals. They all stem from the same queen. Contact Inhibition, Hyaluronan, Longevity, Naked Mole Rat. Bookmark.